"What was the last brave thing you did?" 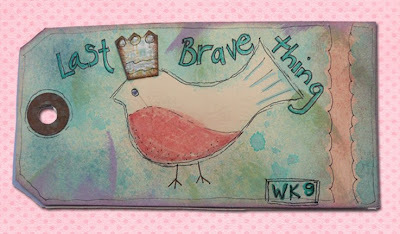 I had trouble journaling this one - I don't consider myself to be very brave. Perhaps that little birdie should have been a chicken!!! I used Glimmer Mist to create the background along with a mask. 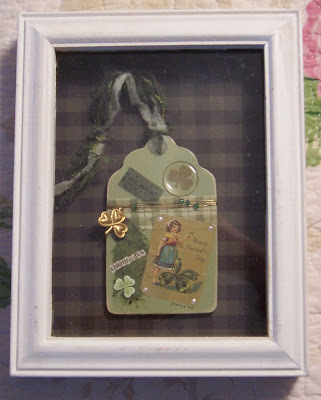 This St. Pat's Day shadowbox is available in my Etsy Shop. Sorry for the "less than perfect" photography - does anyone have tips for photographing things that are under glass? No matter how I angle the piece I can't avoid seeing a reflection on the glass. cute stuff today Jeanne...i love shadowboxes...or anything in a box for that matter!!! This tag was tough for me too! Cute St. Patty's piece! The glare is always a pain. Always no flash and try indirect lighting on a bright sunny day. Cute journal entry Jeanne! I have been playing with the mists too, and I think I am liking the Maya road mists a little better myself. I'll have to play some more.